“I recommend The Art of Good Business to anyone who has been trying to go it alone. I tried to figure out my business path on my own and found a patchwork of information. The Art of Good Business puts a plan out there to follow step by step. Also, because it is cohesive it puts all the information you need into one clear class. I have taken my binder with me everywhere I go to read and re-read the course. I find new depth in the material each time. It is wonderful that this course continues to grow with your business. Vicky Laffey is over in the U.K. and she she said…. “It’s a course that made me realise what was inside me, what I was capable of and what I needed to do. There was a lot to cover but that’s a good thing! I feel like it was also presented in an order that made sense.…For example, I would be doing a task in part 3 and was able to make sense of it because of something we did in part one. …just booked as my biggest gig yet, by $3k…. They refused to give me a budget. Just said that they were willing to pay what was reasonable, flowers were a priority…It was sooo hard to leave my money shoes in the closet and not make disclaimers when I sent the proposal. 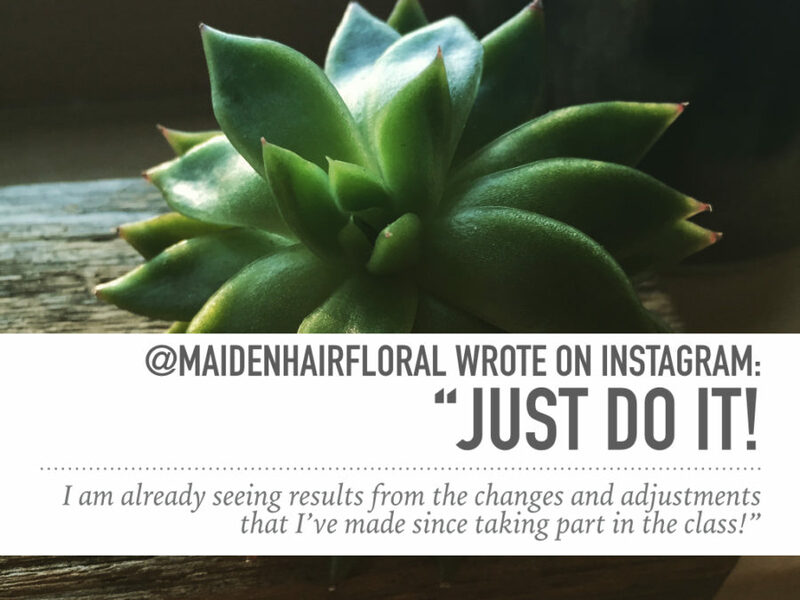 “It was everything I hoped it would be: actionable steps for making my business better. 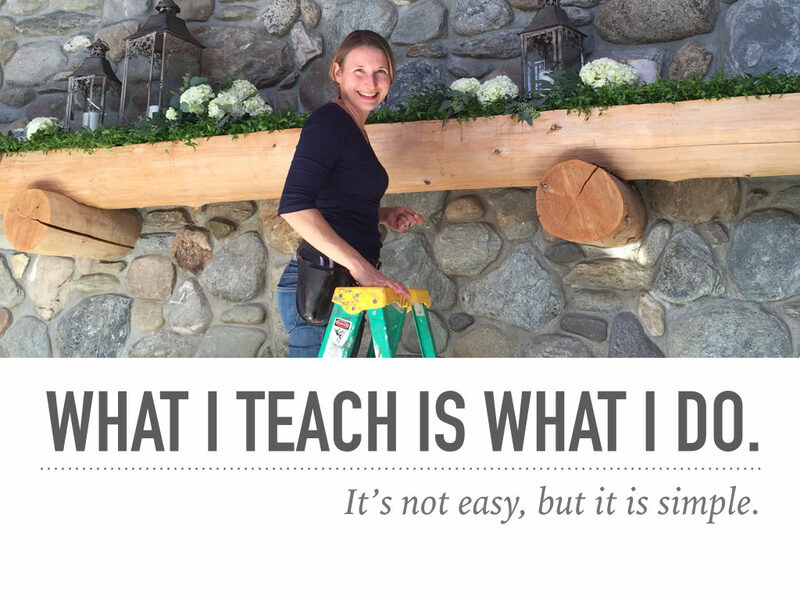 Alison confidently teaches progress over Perfection, which was huge for me. I kept stalling on business progress because it just wasn’t perfect yet, but this is a process and Alison’s course really takes you through all of the steps so even if it’s not perfect, you feel confident that you are going down the right path. 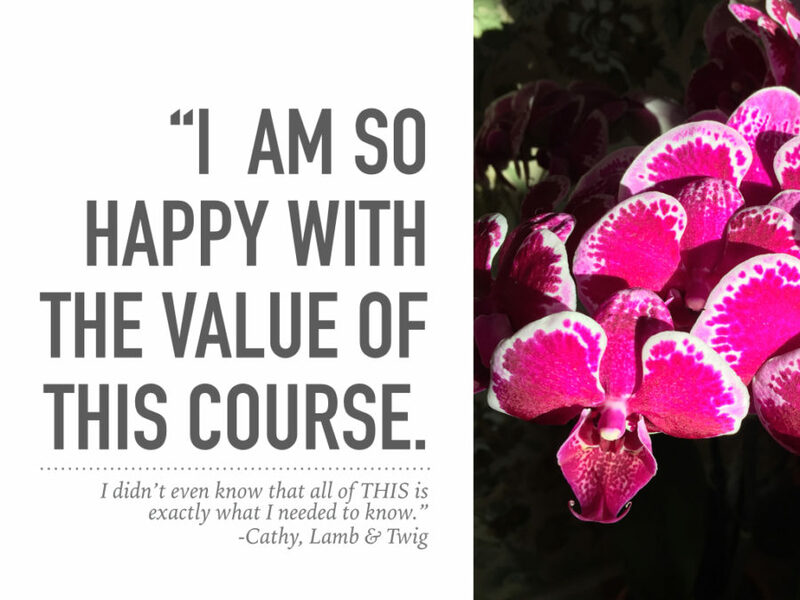 “There is so much content in this course! Definitely exceeded expectations. The most important part of this course for me was the section on choreographing the customer service portion of my business. I am learning how to communicate clearly and lead my clients in a way that builds trust and sets realistic expectations. This course is great for anyone that is ready to refine their business practices. You have to be ready to take action for this to really make a difference. “Because it was nearly impossible for me to attend the live stream, it was invaluable to be able to watch when I was able to. 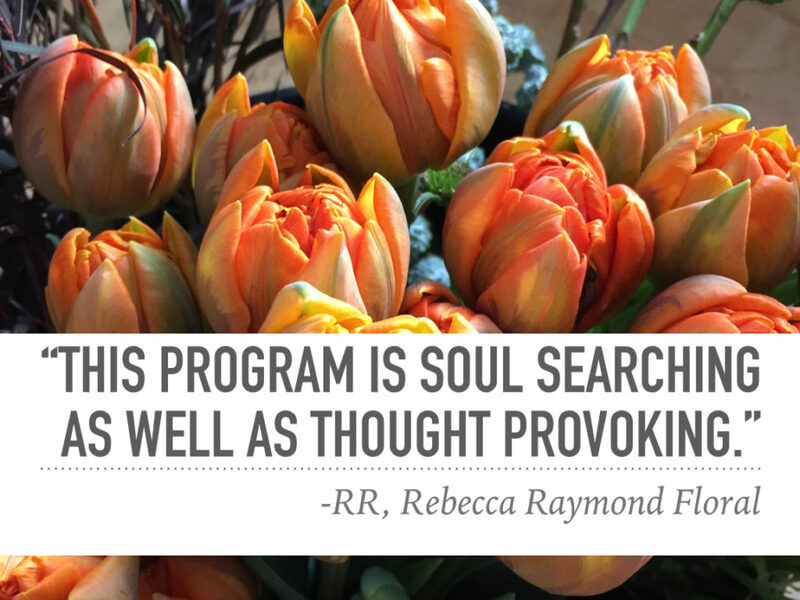 “I was hesitant to start and not finish the course online, but this course was very accessible. [This course is for]…anyone and everyone seriously interested in improving their business. Learning to be passionate, but at the same time differentiate a hobby from a business. It was worth every penny. It was at the top of my affordability at this time in my fledgling business. And I did not have to get a hotel room or plane ticket, which kept me in the game. “After taking Alison’s class I clearly see that once I create my business model based on her guidance, I will have a template to grow my brand that can be only and uniquely mine. The class is broken down into easy to follow format and you can jump around as needed while remaining on target. However, I do suggest that you make sure to utilize all the content…trust me you do not want to miss a thing…Each time I go back over the material, I see things in a deeper hue. I’ve learned about myself, my belief system, my ideal client, my accountability, and my personal wisdom (yes! I have some!) I’ve been given a roadmap for business success that will be a baseline for my future growth…four weeks into the class the inquiries started coming, I booked three clients and have two new prospects! Alison has put her heart and her vast knowledge into this class. She is open and supportive. Honest and kind. She will tell the truth. She is clear and concise. She is a bit of a genius and she’ll bring out the genius in you! Her class is one of a kind because of all the backing and support she offers. Click HERE to join me today! Click here to read more about The Art of Good Business. Click here to sign up to get started TODAY!